For the average gullible Bible Believer who thinks everything he or she hears from their church’s pulpit is Gospel Truth, this afterlife story told by Jesus is but a foretaste of what an unrepentant sinner can expect immediately after death. A. Terminology: The words “sin”, faith, repentance, salvation nor even God occur anywhere in the text. B. Setting: This story is directed ONLY for and at Jews in the Second Temple Period. Thus, like all Jewish theology of that time, no one went to a sky Heaven to live with God (a truly blasphemous thought for pious Jews). However, the Hebrew doctrine of Sheol was modified in to two sections with Abraham’s Bosom on one side and (based on the desert heat and lack of fresh water) the theme of suffering on the other side was well understood. C. Abraham: This father of the nation of Israel is made into a divine God like figure in whose bosom the righteous Jew will rest eternally like a baby. 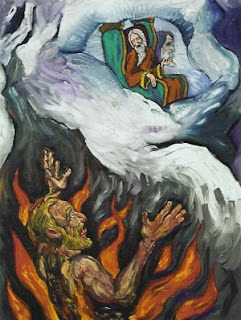 D. A Jewish Divine: Abraham reveals laws (Oral Torah) to the Rich Man about the afterlife which are found nowhere else in the Hebrew Bible, but abound in Jewish apocryphal folk tales. As with most all Jewish religious literature of the Second Temple Period, the future afterlife is based – not on faith –but on works. In conclusion, the Rich Man’s suffering in Hell (Hades) has nothing to do with faith in God, but with the fact he didn’t care for the poor by sharing his wealth; in this case with Lazarus.